1. Recruitment Place, Date and Time: Please see advertisement SL No. 14. 2. Recruitment Exam Center: Please see advertisement SL No. 14. 4. Educational Qualification: SSC/Equivalent pass minimum GPA 2.00. Tags: Ministry of Defense Constabulary (MODC) Soldier (সৈনিক) Recruitment Circular 2019, Application Process of Army MODC sainik. 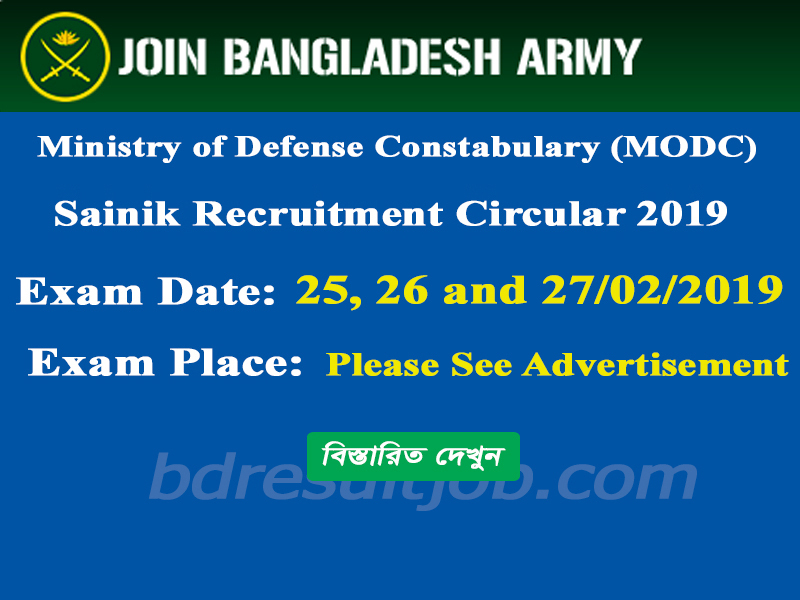 Ministry of Defense Constabulary (MODC) Recruitment notice 2019, Sainik circular, join army sainik, army job circular new, Army sainik latest news of sainik bangladesh, Ministry of Defense Constabulary (MODC) Recruitment District wise Exam Place, Date and Time. Ministry of Defense Constabulary (MODC) Soldier (সৈনিক) Recruitment Circular 2019, Application Process of Army MODC sainik. 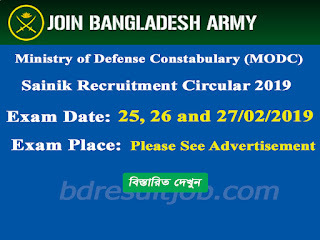 Ministry of Defense Constabulary (MODC) Recruitment notice 2019, Sainik circular, join army sainik, army job circular new, Army sainik latest news of sainik bangladesh, Ministry of Defense Constabulary (MODC) Recruitment District wise Exam Place, Date and Time.